Recently, Lupe Fiasco has been catapulted to national media attention, not (just) for his music but his political commentary. Two weeks ago on an internet interview with CBS Fiasco said, “To me the biggest terrorist is Obama in the United States of America. I’m trying to fight the terrorism that’s causing the other forms of terrorism. You know the root cause of terrorists is the stuff the U.S. government allows to happen. The foreign policies that we have in place in different countries that inspire people to become terrorists.” While this set off a firestorm of angry comments and media attention about Lupe’s uncritical eye and virulent condemnation of the continuing trope of Barack Obama as a terrorist, most of these comments miss the mark. Lupe Fiasco, as his name signals, routinely finds himself in controversial positions that are both contradictory and illuminating at the same time. Lupe’s comments about Obama and politics, in a way, channel Malcolm X’s and Martin Luther King Jr’s political commentary. In November of 1963, Malcolm X commented on President John F. Kennedy’s assassination by suggesting the violence that took Kennedy’s life were “chickens coming home to roost.” At this time, Kennedy was thought of as a friendly president to Black folks and ultimately this became a wedge comment that alienated him from many Black Americans who identified as politically progressives but found his comments irresponsible given the contentious political climate. Less well known, but equally allegorical Fiasco’s remarks eerily reflect Martin Luther King’s speech in 1967 at Riverside Church in Harlem where he said, “They ask if our own nation wasn’t using massive doses of violence to solve its problems, to bring about the changes it wanted. Their questions hit home, and I knew that I could never again raise my voice against the violence of the oppressed in the ghettos without having first spoken clearly to the greatest purveyor of violence in the world today — my own government.” While Lupe is no Martin Luther King, both were concerned with the government’s role in supporting violence locally and internationally. At the time of King’s comments the United States was enmeshed in a war that he found unconscionable and history would reveal was unnecessary. In many ways Lupe has been outspoken about Obama’s military advocacy and in 2008 found himself in a flap with another Chicago rapper turned political candidate RhymeFest. Fiasco is no stranger to politically complex views, which he laments are often “dumbed down” into sound bites. Later in the CBS interview, Fiasco states that he does not vote and that his own beliefs about what a vote endorses keep him from the ballot box. Not surprisingly many have responded “If you don’t vote you can’t complain.” To Lupe’s credit he follows in a long line of Black commentators and activists who chose not to vote but offer critical commentary. For many, including Fiasco, voting in a two party system connotes support for a system that they find too limiting and non-representative. In “Words I Never Said”, Fiasco outs himself as a non-voter, “Gaza strip was getting bombed, Obama didn’t say sh*t/That’s why I ain’t vote for him, next one either.” His decision not to cast a ballot doesn’t curtail his speaking or even wearing his politics on his chest. 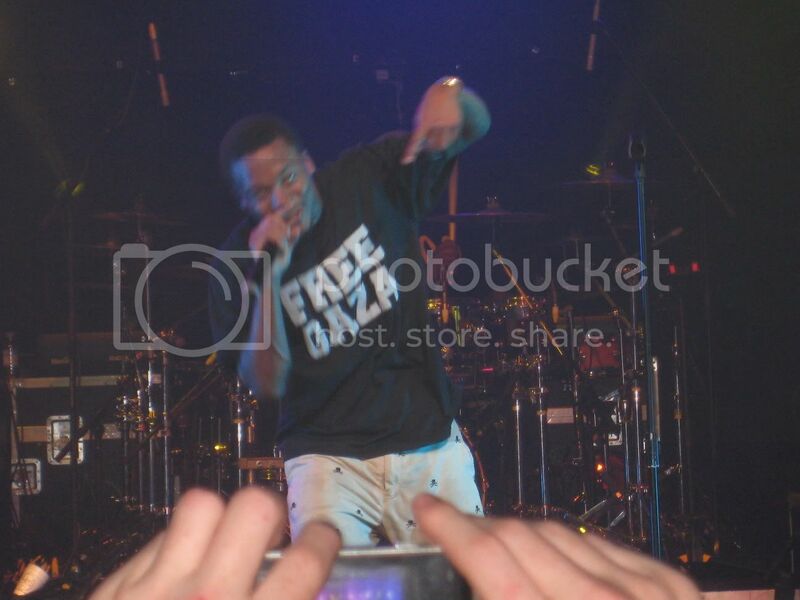 Fiasco, as an avowed Muslim, has been known to rock “Free Gaza” shirts on stage just as easily as he does designer fashions. For Lupe, the continued instability of the Middle East is directly linked to United States involvement which makes Obama culpable given he is Commander-in-Chief of the US Military. While we may not all share Lupe’s critical stance on Obama or American politics (and most of us don’t read the wikileaks wires, though we should) there is a line of logic and historical precedence for his comments. In listening to the knee-jerk responses to Fiasco’s words the significance of his hit single “Words I Never Said” rings out. The song is a critique of the curtailing of rights, particularly free speech, in an era of perceived freedom and liberty. If we don’t listen and take Lupe’s words seriously, it’s almost as if we’ve made his point even louder. I don’t agree with Lupe Fiasco calling the president a terrorist, but I have more respect for him speaking up for what he believes is right. Just because the president is Black doesn’t mean we should leave our beliefs at the door or castigate those who do not agree with the Obama administration’s policies. on in speaking that strong critique because he hasn’t YET walked a walk to earn that kind of talk! I admire his verve and see great potential in him, but Lupe’s just too young to really know and experience those words, too in love with IDEA of being an intellectual resistance revolutionary. It just shows that he needs to grow into being what Grace Lee Boggs calls a “solutionary” as well as an intellectual revolutionary. I’m glad that someone finally pointed out that Lupe has political views that extend beyond Kanye-esque one-liners, but I’m not convinced that anyone should care, at least regarding the CBS/O’ Reilly matter. The difference here is that Malcolm X knew that history was a powerful weapon; one to be used in criticisms against an unjust state. Lupe has failed to arm himself with history when facing these reporters and pundits, and for that he should be ashamed. If he won’t expound on his views in front of a bully like O’ Reilly, why should we assume he has any? He doesn’t understand the difference between “not dumbing it down” and being deliberately obtuse. That’s not smart, it’s condescending and arrogant, and I don’t want to believe that he’s either of those things. Ah! The ol’ rapper turned political critic thing. Imagine what would happen if he could actually articulate what he means to say, we’ve all thought it – why is NATO in Libya, why is America in Iraq, why wasn’t NATO in Egypt… you know? The problem is, in order for him to allow his voice to be heard on something other than the violent lyrics suburban white kids have come to love, he chooses O’Rile-Me. Turns out, he didn’t think enough about what he had to say. I think there is a severe difference between being a “critic” or a professional commentator and having a comment or a critique tied to an overall theory grounded to a practical project. I see Fiasco standing for certain principles or rooted in a belief system. But I don’t see what his political project is. He might have one that my pop cultural un-savvy mind just might be aware of.